Aug. 1917. Salonika, Caucasus, and Asia Minor. Daniel Stewart's College; First XV. M.B., CM. 1894; M.D. 1899; D.P.H. 1898. R.A.M.C. 1900. 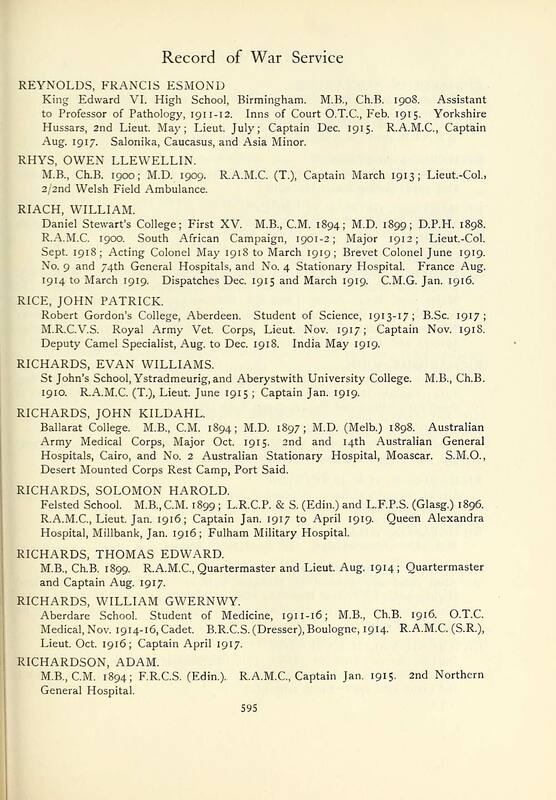 South African Campaign, 1901-2 ; Major 1912; Lieut.-Col.
Sept. 1918; Acting Colonel May 1918 to March 1919; Brevet Colonel June 1919. No. 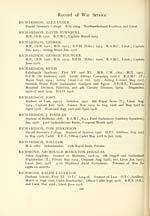 9 and 74th General Hospitals, and No. 4 Stationary Hospital. France Aug.
1914 to March 1919. Dispatches Dec. 191 5 and March 1919. C.M.G. Jan. 1916. M.R.C.VS. Royal Army Vet. Corps, Lieut. Nov. 1917 ; Captain Nov. 1918. Deputy Camel Specialist, Aug. to Dec. 1918. India May 1919. St John's School, Ystradmeurig, and Aberystwith University College. M.B., Ch.B. 1910. R.A.M.C. (T.), Lieut. June 191 5 ; Captain Jan. 1919. Desert Mounted Corps Rest Camp, Port Said. Felsted School. M.B., CM. 1899 ; L.R.C.P. & S. (Edin.) and L.F.P.S. (Glasg.) 1896. Hospital, Millbank, Jan. 1916 ; Fulham Military Hospital. Lieut. Oct. 1916; Captain April 1917. Editor, Major John E. Mackenzie. Edinburgh: Printed and published for the University by Oliver and Boyd, 1921. With portraits. 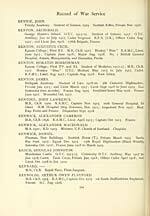 Scottish First World War rolls of honour containing listings of casualties and those who died while on active service. Includes rolls for organisations, such as schools, universities, clans, businesses and churches, as well as for places all over Scotland. Also some orders of service for unveiling of war memorials.